Despite what 90% of the people in a recent poll we undertook think, consumers in Botswana are remarkably well protected. The Consumer Protection Regulations, enacted sixteen years ago are incredibly useful tools that we consumers can use to protect ourselves and they give us rights that many other places in the world don’t offer. We even have an agency, the Consumer Protection Unit within the Ministry of Investment, Trade and Industry with the power to enforce them, whether suppliers and stores like that or not. Last week we covered some of the rights but there’s a whole lot more of them that you and I should really understand. Did you know, for instance, that suppliers must offer commodities and services “with reasonable care and skill”? Section 15 (1) (a) says that the guy repairing your cellphone or laptop is required to possess and demonstrate the sort of skills you would reasonably expect him to have. Obviously, you can’t expect miracles, so the ancient phone you inherited from one of your kids that you just dropped in the bath is probably dead. Sooner or later your ancient Blackberry will be beyond repair. However, you still have a right to expect anyone who does a job for you to do it in a reasonably careful and skilful manner. Section 15 (1) (e) says that if any transaction is cancelled “in accordance with the terms of an agreement, advertisement, representation, or provision of law” then the supplier must “promptly restore to the consumer entitled to it a deposit, down payment, or other payment”. How is that relevant to you and me? It means that if a supplier fails to deliver your goods and you’ve given them an ample opportunity to fix the problem you’re entitled to cancel the deal and get back whatever money you paid them. It doesn’t matter if it’s the wedding photographer who didn’t take pictures, the car dealership that took your deposit and then increased the price of the car or the store that delivered second-hand goods instead of new ones. Whatever the circumstances, if you legitimately cancel a deal you must be given your money back. It’s that simple. Then there are two sections that work together very well. Section 13 (1) (b) says that any “supplier who offers a commodity or service to a consumer fails to meet minimum standards and specifications if” “the commodity or service causes a probability of confusion or misunderstanding as to its source, sponsorship, approval, or certification”. A little later, Section 13 (1) (d) forbids a company from claiming that an item “is of a particular standard, quality, or grade” or that it’s “of a particular style or model” if their claims “cannot be substantiated”. This means that someone who sells you something must be extremely careful about how they describe it. If they say that it’s a particular model, then that must be true. If they say it’s of a particular quality then that also must be true. If they say the items are from a particular country then that must be true as well. Most importantly if they say that their item has been approved by a particular company or regulator then they can’t be lying or exaggerating. For instance, you’ll occasionally see that a piece of technology has been approved for use with devices from a certain manufacturer. That isn’t always true. In China there were cases of fake iPhone charger cables that exploded, injuring their users. Some years ago here in Botswana a reader showed us the jeans he’d been wearing when the battery in his Nokia cellphone spontaneously caught fire. The problem was that it wasn’t actually a Nokia battery, it was a replacement he’d bought having been assured it was suitable for his phone. It wasn’t. He was lucky only to have his jeans catch fire. A supplier will also be in deep trouble if they falsely claim that an item has been certified by a particular regulator. We’ve seen cheap electrical irons that appear to have an approval mark but which turns out to be fake. They weren’t approved by anyone at all, they were fakes, extremely dangerous fakes. Luckily electrical irons are covered by one of the Bureau of Standards’ compulsory standards and can be seized and trashed if they’re not safe to use. We all love a bargain, don’t we? I certainly do and when I see that something has been reduced in price that’s always a good thing. But is it a genuine reduction? Section 17 (1) (a) of the Regulations forbids suppliers from “making false or misleading statements of fact concerning the reasons for, existence of, or amounts of price reductions”. So if the supplier says there’s 10% off the prices today then that must be the truth. If they deliberately increased the prices yesterday so they could reduce them the next day, claiming that the goods were now discounted, they’d be in trouble as well. Price reductions must be exactly what they claim to be, real reductions in price. The next section is a very good one, it’s just a shame that so few people know about it. It says that it’s “an unfair business practice” if someone claims that “a part, replacement or repair is needed when it is not”. What could be simpler than that? If your car mechanic, cellphone or laptop repairman or your electrician tells you that something needs to be fixed then he must be telling the truth. But how confident are you that this doesn’t happen? Are you really sure that the people who fix things for you are always telling the truth? I’m certainly not. We’ve heard many times from consumers who’ve been asked to pay for expensive repairs that turn out to have been unnecessary, just very profitable for the repairer. The problem is that very few of us are qualified to argue with the person we believe is an expert. 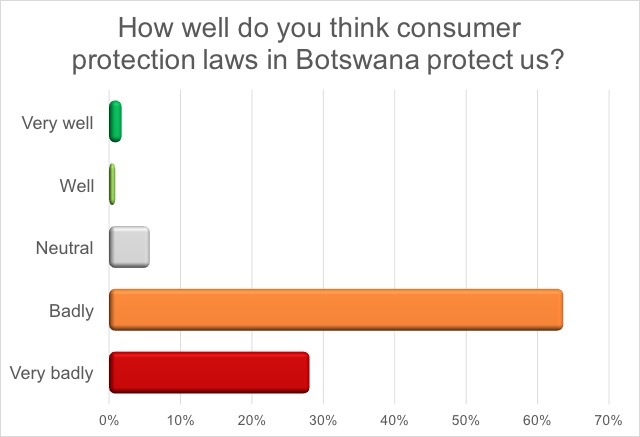 With all these protections and the ones mentioned last week, I think that consumers in Botswana are very well protected. The only problem is that people haven’t been taught what protections they have and if you don’t know something’s illegal, how can you be expected to complain about it? Facebook. Get used to it.